English, first edition. Only edition I'm aware of as of 2012. 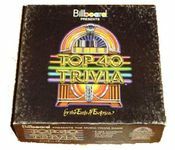 Four decades of music trivia, split into two categories: 50s and 60s category, and the 70s and 80s category. Track your progress on the board with a plastic token representing a pressed record and let the trivia flow!